Massages are a relaxing way to spend the day when you’re here in Naples, Florida or just anywhere in the Paradise Coast. 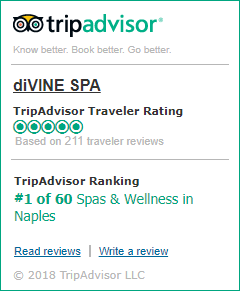 If you are a vacationer spending time on the beach or an athlete from the many golf courses or the several other sports facilities in the area, you are sure to be welcome here in the diVINE Spa. With that said we offer Swedish massages for all you spa addicts and also Deep Tissue massages for the sports people. These two modalities have so much in common that we frequently get asked just what is the difference between the two. We have covered these to modalities in their own separate blog posts but let’s compare and contrast the two for a bit, shall we? The modalities are similar in which they are applied by the therapist. Both use long strokes, kneading and circular movements of the palms, elbows and fingertips. Oil and lotion can be used for lubrication and relaxation purposes. They are both used to loosen up tight and tense muscles or getting rid of muscle knots. Also, applying firm pressure along many parts of the body can be done in both modalities, that’s probably the reason why many find the two very similar. This similarity stretches out to the benefits of the two massage types. They alleviate lower back pain and promote a healthy blood circulation and can even do a lymphatic drainage on your body, thus leading to a healthier immune system. Similarly, tensions on the back of the neck and shoulders can be eliminated by these two massages. However, similar these two modalities may seem at first, these massage techniques can be very different in terms of their intended purpose and to whom they can benefit more. At its core, the Swedish massage aims to promote relaxation of the body, to lower the cortisol levels that a person has, relieving them of stress and keeping it that way. The Deep Tissue Massage, on the other hand, is a more intensive procedure that targets the inner layers of the muscle and thus can sometimes be painful to the one receiving the massage. This means that Swedish massage can be opted by casual spa-goers with not much of a problem while in Deep Tissue you’d still have to negotiate with your therapists just how far your pain tolerance can go. This is done to address certain bodily issues like flexibility and mobility which are crucial factors to consider if you are an athlete. Swedish massage and Deep Tissue massage have their own similarities and differences but no matter which you choose you should keep in mind to have an open communication with your therapist. So it helps that all of our staff in the spa are friendly and can easily assess the needs of each client. Give us a visit in our spa in downtown Naples, Florida to know more about us and our services. If you have any questions before showing up, feel free to chat with us on the online chat in our website. We hope to get in touch with you soon.